Bait Blu-ray Review. Bait is almost so bad it's D-Grade and this is why it works. Australia has a love-hate relationship with sharks. They are equally feared and respected across this continent and often misunderstood to be a bigger threat to man than they actually pose. The new Australian film Bait may just suffer the same judgment as their underwater protagonists, but not until you watch Bait should you make up your mind about this down under death fest. Bait’s story is simple and outrages all in one. Boring, generic lifesaver Josh (Xavier Samuel) is having a bad day. He has a hangover, no acting ability, and is about to marry an over tanned rake called called Tina (played with the same intensity of a paper bag blowing in a slow breeze by Sharni Vinson). To top it off, he also has to watch his fiancés brother get eaten by a great white shark and keep his hair looking perfect at the same time. All of this proves too much for Tina, so she leaves to pursue her next groundbreaking role on whatever 3D Step Up film is currently shooting. Josh retreats to a life of not showering and stacking shelves in the local supermarket. To great surprise, the couple is soon blissfully reunited when Tina returns with two new facial expressions and one new boyfriend. It is here we are introduced to the rest of our cast. The rest of the live bait are uninspired castoffs that include: cops and robbers, nerds and jocks, mean girls and basket cases. All this makes for a perfect time for a tidal wave to hit and trap the acting elite in the supermarket with two bloodthirsty great white sharks. 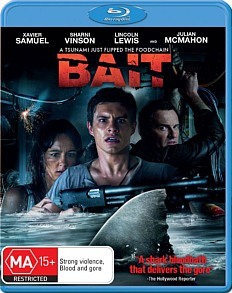 Anyone who walks into an Australian shark movie called Bait expecting quality needs their head checked. This film is stupid, gory and corny. The piece is given a generic setting to try and convince dim American audiences that it could be happening on their shores. This approach doesn’t work and the mix of accents only adds to the hilarity of the piece. The acting and script is terrible throughout and this leaves you waiting for the kills. Like any good B-grade horror piece, the kills are the most important factor. They are graphic, funny and happen just often enough to keep you interested. The shark work is terrific with both CG and animatronic work being quite good for a homegrown piece. Not relying on CG was a wise directorial move and keeps gore on screen in a tangible way. Bait is almost so bad it's D-Grade and this is why it works. Steer clear if you don’t like Aussie cinema or B Grade horror. For those that do get a kick out of these two types of cinema, check it out for a laugh. The effects in Bait are good, but like all shark horror films, mostly uninspired and done before. This film will work better after beers and a BBQ with friends this summer. Just don’t go swimming afterwards!